by Mann, Richard A., Roberts, Barry S.
Mann, Richard A., Roberts, Barry S.
Barry S. Roberts received a B.S. in Business Administration from Pennsylvania State University, a J.D. from the University of Pennsylvania, and an LL.M. from Harvard Law School. He served as a judicial clerk for the Pennsylvania Supreme Court prior to practicing law in Pittsburgh. Professor Roberts is currently Professor of Business Law at the Kenan-Flagler School of Business Administration, University of North Carolina at Chapel Hill. He is a member of Who?s Who in American Law, Outstanding Young Men of America, and the North Carolina and Pennsylvania Bars. Professor Roberts has written numerous articles on such topics as antitrust, products liability, constitutional law, banking law, employment law, and business associations. 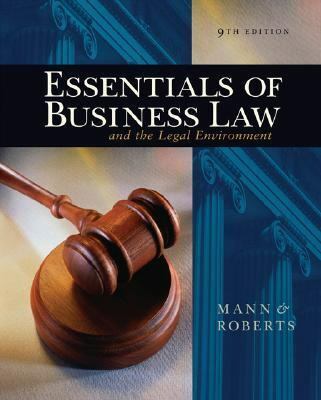 Professor Roberts is a founder, managing director, and instructor in the Carolina CPA Review.Mann, Richard A. is the author of 'Essentials of Business Law And the Legal Environment ', published 2006 under ISBN 9780324303957 and ISBN 0324303955. Loading marketplace prices 11 copies from $0.82 How does the rental process work?